I took Levaquin for a sinus infection in the Fall of 2008. I developed cramping in my calves that night and it woke me from my sleep. I had never had that happen before. The next night it happened again but this time even worse and I couldn't sleep at all. I looked up levaquin and cramping in a google search and I started to get scared. I called my best friend whose father is a doctor and her father told me to stop taking the levaquin. A couple months later I developed chondromalacia patella in my knees and piriformis syndrome- both conditions caused by muscle and tendon imbalances. To this day, I have been diagnosed with tendonitis and bursitis in my knees, shoulders, and hips. I think the levaquin played a part in this but I wouldn't win a case in court because I also have been diagnosed with hypermobile joints that can cause all these problems. They would say that there is no proof that the levaquin caused the problems and not the hypermobility. All I would be able to say is that the only problem I had for the 22 years before this was ankle instability. Sorry to hear all that. Levaquin cytotoxicity can certainly be a life changer. lawsuit thing. It's going to take a major change in the system before the establisment starts admitting that possibly Levaquin might be dangerous (even though MANY fluoroquinolones have been pulled off the market and out of test trials due to their dangerous side effects. Still, you may want to jump into a class action lawsuit anyway, if only to add to the momentum. -Maybe- the hypermobility played a role, but when you take a drug and have pain/injury the very same/next day, to ME that's pretty clear cut. Thanks for sharing your story, and check out the Levaquin Tendonitis Treatment page if you haven't already. Levofloxacin immediately attacked my tendons! I have taken Cipro, in the same family as Levofloxacin, for many years without suffering from any side effects. Now, I am certain that I will contact an attorney as on the 4th day of dosage, taking 1 500mg tablet daily starting on 02/02/2013, my neck, shoulders, hips, and knees froze up like the Tin Man in The Wizard of Oz without oil! I forced myself to go to work even though I could not even bend my legs to put clothes on. I leaned against the wall while my husband dressed me, and went to work on crutches on Tuesday 02/05/2013. Now my neck, shoulders and knees are stiff, and so painful I cannot sleep for more than a couple of hours a day. Standing up and sitting down takes all my mental effort. I am not a 'sue happy' person, have had legitimate cause to do so in the past but did not. I really am angry and frightened! When the tendon attack initially hit I could not move for nearly 5 hours, not at all! I thought I had meningitis, or palsy/polio had suddenly came on me at 52 years of age. What recourse do I have? I need pain medication, I need therapy, and most of all, I need to get back to my old healthy energetic self!! All this over a sinus and kidney infection?!!?? Someone please advise me as to how I can get the drug company to pay for my recovery. Why in the world have you been taking Cipro for years? I can't help with the lawsuit at all, but I certainly suggest you get to work trying to help your body move back towards normal by countering all the nutritional depletion done by the Cipro. And fast. You're suffering from massive nutritional depletion. The body doesn't have what it needs to operate properly. 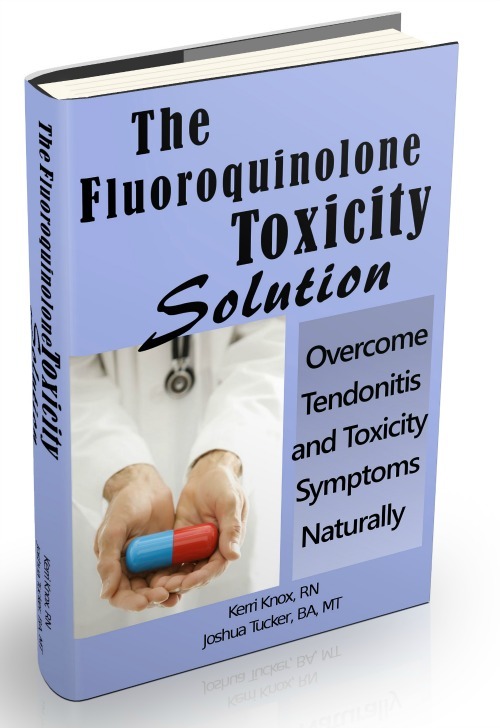 Towards that I point to the The Levaquin Tendonitis Solution ebook, as you need a complete plan of attack and not a tip or a trick (which just isn't going to cut it).